The global gluten-free food & beverage market is expected to register a CAGR of 14.2% during the forecast period. In developed countries, product selection is the most important factor for choosing gluten-free foods and beverages, followed by low price, convenience, good service, proximity to where the consumers live or work, knowledgeable staff to help, and friendliness of staff. Europe is the fastest growing market owing to health concerns in this region. The gluten-free food market has witnessed a strong growth even among non-celiac patients, with new product introductions in snacks and beverages. Overall, the market for gluten-free products has undergone a radical change from being present only in pharmacy/nutrition stores to finding their place in grocery outlets. The demand for gluten-free products mainly comes from health-conscious consumers who are influenced by natural and organic ingredients consumption. The main buyers of these products belong to two different age groups, 50-64 years and 25-34 years. These consumers are further influenced by advertisements. Around 20% of consumers in the developed countries of North America and Europe prefer to buy gluten-free products regularly, while another 22% buy them occasionally. Majority of the consumers buying gluten-free products suffer from celiac disease (CD) and follow a strict gluten-free diet (GFD) as it is the only treatment for managing the disease and reducing the risk of other complications. 3.1 million Americans now follow a gluten-free diet and 72% of them are classified as "PWAGs" or people without celiac disease avoiding gluten. Other types of consumers include those suffering from several other conditions, including non-celiac gluten sensitivity, wheat allergy, autism, ADHD, multiple sclerosis, and irritable bowel syndrome (IBS). The third category of consumers want to consume gluten-free products just to maintain their bowel condition. Gluten-free products have been gaining traction through strong retail presence and government initiatives. The market has become highly competitive, with innovation in products being a major approach to becoming dominant in the market. However, there are many challenges in terms of improving the quality of products, which is a major issue in developing regions. 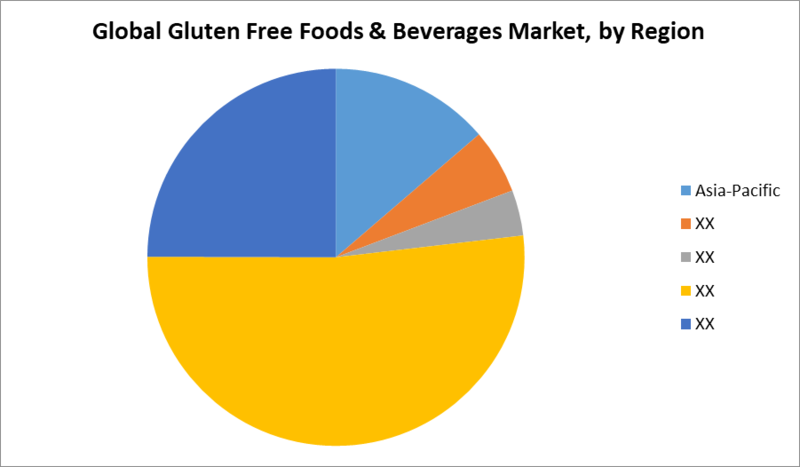 The gluten-free food & beverage market is segmented into beverages, bread products, cookies & snacks, condiments, seasonings & spreads, dairy/dairy substitutes, meats/meat substitute, and other types of gluten-free products. More products are regularly entering these categories, thus increasing competition for manufacturers. For example, salty snacks, which have a major share in the gluten-free food market, contain vegetables and legumes that offer increased health benefits by containing more fibers and nutrients. In terms of launches, gluten-free bakery has the highest launches consisting of biscuits (more than 40% of total global bakery launches), ahead of bakery ingredients and mixes (30%). Pulses have become a popular choice for making gluten-free pastas and baked foods and snacks, and are gaining in appeal from health-oriented shoppers who seek products high in protein and fiber. In the United States, gluten-free beverages have high demand than other countries - they rank after bakery, snacks, sauces & seasoning, processed fish, meat, and egg products in terms of sales. North America and Europe are leading the market, together accounting for more than 70% of the market share. North America is the largest market for gluten-free products, with the United States as the market leader. It is projected that Europe will witness significant growth during the forecast period, with the United Kingdom as the leader. Several retailers, such as Walmart, Loblaws, Metro, and Sobeys now have private label gluten-free products. More than 60% of gluten-free purchases happen in supermarkets and mass merchandisers, 30% from health and natural food stores, and the remainder from club-type stores, drug stores, and other retailers. The Asia-Pacific & South American regions have a relatively nascent market due to low awareness among consumers. The Middle East region is emerging as one to look out for in the gluten-free sector, with United Arab Emirates as the key destination. Gluten-free diets are becoming increasingly common among various consumers, mainly the Europeans. To get ahead of this trend, DSM has secured European Union regulatory approval to market the first and only enzyme demonstrated to effectively break down residual gluten. Gluten-free food was named one of the top trends by the National Restaurant Association, and franchise restaurants are in pursuit of customers seeking gluten-free snacks and meals. From pizzas to pastas to pastries and cookies, franchise food brands are adding gluten-free items to their menus, a nationwide phenomenon expected to continue growing in the coming years. This is a huge opportunity for investment. Another opportunity is creating websites and apps to find gluten-free restaurants, bakeries and other businesses in the area, complete with contact information, ratings, reviews, and directions. The market for gluten-free foods & beverages has undergone a radical change from being considered specialty niche products to becoming mainstream products. The market is highly competitive, with innovation in products being a major strategic approach adopted by leading players. This trend is likely to continue in the future, as the established set of players seek to garner increased market share. Gluten-free food manufacturers are adopting the strategy of patenting to gain exclusivity in the market. For example, General Mills, Inc. had filed a patent application on a method and system designed to make gluten-free oats. Those companies who do not have their own gluten-free products are trying to acquire companies having gluten-free products in their portfolio. In 2015, Pinnacle Foods, despite being skeptical about the gluten-free products market, entered into an agreement to acquire Boulder Brands for approximately USD 975 million. Boulder Brands manufactures gluten-free and frozen food products as well as a line of shelf-stable spreads under the Udi’s, Glutino, Evol, and Smart Balance brands. Major players: General Mills Inc., H.J Heinz Company, Hain Celestial Group Inc., Boulder Brands Inc., and Dr. Schär, among others.